One of Bob Vickrey’s favorite breakfast spots was the Gourmet Gala on Antioch. I’ve always been a fairly easy guy to find on most mornings in the Palisades village. Just peek in the door of my favorite local breakfast spot, and I’ll be there sipping coffee while reading my newspaper and awaiting my scrambled eggs. Gourmet Gala on Antioch Street was one of those comfortable spots where I found a morning home for many years in the 1980s and ‘90s. The narrow little café, which was run by the lovely and personable Angela Croal, was my breakfast haunt for many years as I shared coffee and convivial conversation each day with pals Richard, Danielle, Judy, Valerie, Roger and unexpected drop-in appearances by other friends. Many of us had initially met at Pierre’s Bakery on Swarthmore a few years earlier but had eventually drifted across Sunset Boulevard to Angela’s cozy café. The café had a counter and deli case on one side of the room and a row of small tables along the adjacent wall. A “crowd” there consisted of about a dozen customers. Good luck getting in the front doorway if you happened to be the 13th customer arriving. I’ve always been a creature of habit and have traditionally found a comfortable spot to enjoy a morning cup of coffee with my newspaper. I realized recently that my ritual had begun all the way back in my Texas college days at Baylor University when I hung out at George’s Café, where I often worked on my stories for the campus daily newspaper. 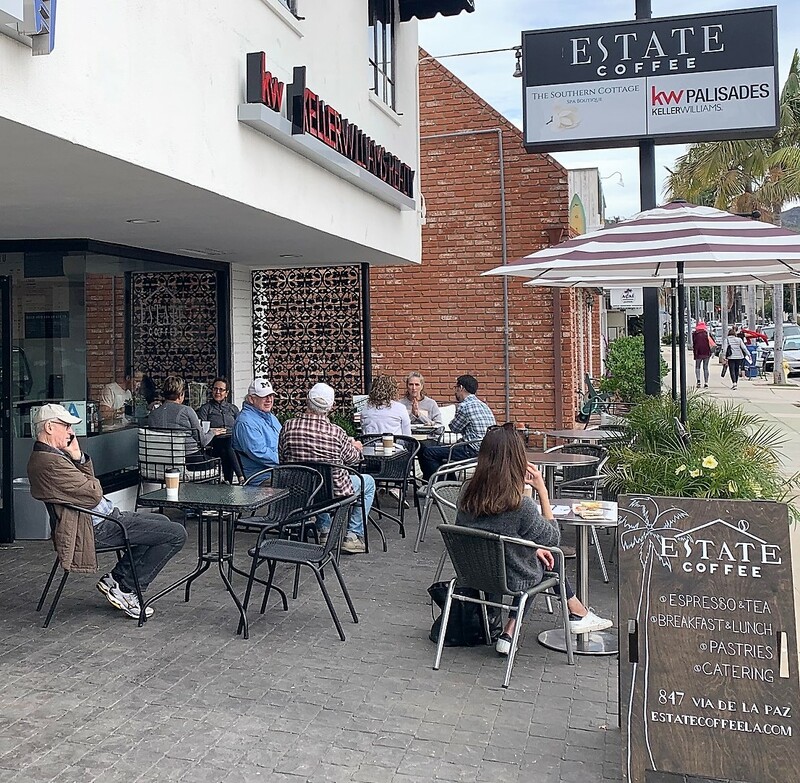 When I first arrived in Pacific Palisades, I stumbled upon Art Poole’s Café on Sunset Boulevard where Rick Caruso’s Palisades Village now stands. 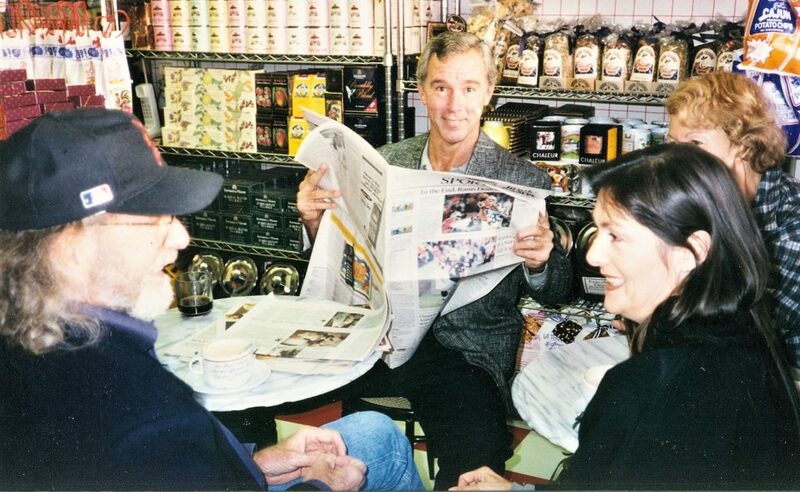 I hardly knew anyone in town back then, so I sat at the counter where I was kept company by my trusty L.A. Times. 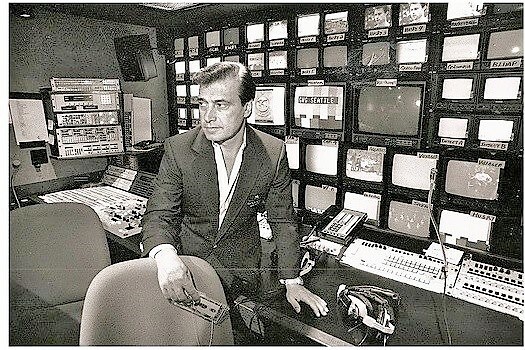 I remember being waited on there by a diminutive and crusty gray-haired woman named “Zona.” After attempting to make small-talk with her that first trip, I quickly returned to my sports page. Fortunately, I soon discovered Mort’s Delicatessen, which was then the town’s unofficial “Cheyenne Social Club,” and where I soon began meeting my community neighbors. During my first trip to Mort’s, I realized that after paying my tab at the check-out counter, all the tables were taken. As I scanned the room in search of an open seat, I noticed a friendly, well-dressed gentleman waving me over to sit with him at the large communal table near the front window. After we introduced ourselves, I asked him what he did for a living, and he replied, “I write the “James Bond” movies.” I thought to myself “Welcome to Hollywood, Bob!” His name was Richard Maibaum. 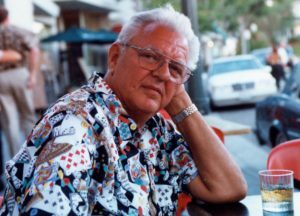 (And sure enough, the next time I saw “Goldfinger,” there was Richard’s name emblazoned across my television screen in the opening credits.) During our next few meetings at Mort’s, it seemed like he introduced me to just about every regular customer there.During the coming years, I alternated my breakfast spots in town between Mort’s, the First National Food Company (where Kay and Dave’s is now located), and the Palisades Drugstore Café. Each had its own unique character and charm. The Drugstore Cafe was a haunt of Vickrey’s for many years. 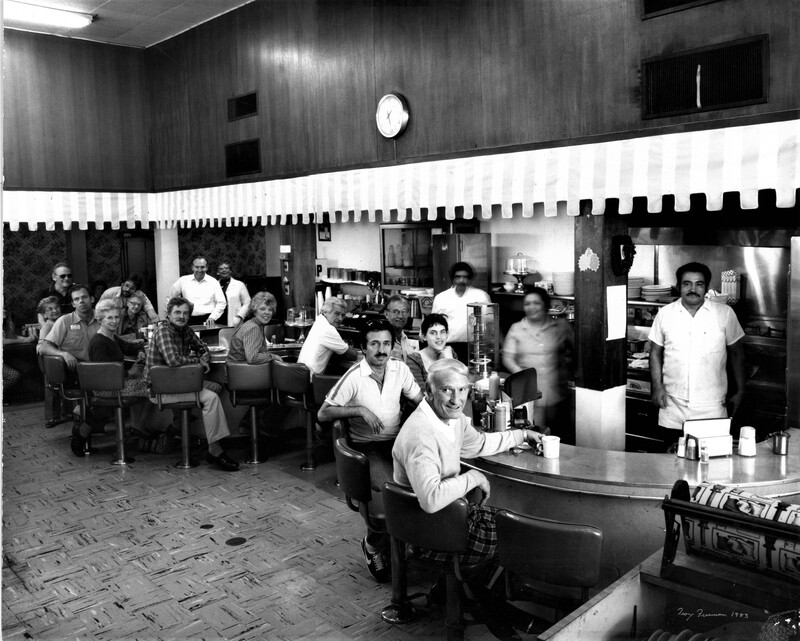 The Drugstore Café was a friendly social spot that featured two adjoining horseshoe-shaped counters that made for easy conversation with your seatmate. When I looked up from the menu during my first visit, there was the irrepressible Zona standing impatiently next to me with her order pad in hand. This time she actually smiled at me, so I figured she must be enjoying her new working environment considerably more than her last stop. I was relieved she was in a better mood but decided not to push my luck with attempted conversation. The first time I tried their house blend, I decided that it had the consistency—and likely the taste—of 40-weight Quaker State motor oil. I was informed by their barista that this was what real coffee was supposed to taste like, so like the glutton for punishment that I am, I kept coming back for more. Our ritual continued through several remodeling projects, with each incarnation of the space becoming more uncomfortable than the last. We ultimately decided that management had purposely made the place as uncomfortable as possible for customers, so we would buy our coffee and keep on walking out the door. We ultimately did keep walking—and, in fact—never returned. In recent years, I’ve frequented Gelson’s popular Victor Benes Bakery and enjoyed their tasty baked goods on their outdoor patio while simultaneously breathing in the noxious fumes of delivery trucks passing our table in the parking lot. How about a little carbon monoxide mixed with your morning blueberry muffin? I still truly love Café Vida’s healthy breakfasts just like everyone else in the Palisades, but the half-day wait for a table began bumping into my lunch hour, so I’ve adjusted my visits there to later in the day for takeout orders. My favorite breakfast spot these days is the somewhat under-appreciated Palisades Garden Café which is down the street from the post office on La Cruz. Their food is terrific and comes at throwback diner prices. The employees are friendly there and the place runs efficiently under the supervision of personable owner James Kwon. Our newest food market, Vintage Grocers on Sunset is quickly becoming known for its hot food counter—and particularly for their breakfast offerings. It features several egg dishes, as well as sides of crispy bacon and various sausages—all at bargain-basement prices, as compared to local sit-down restaurants. My cardiologist lives in town, and I fear that he might walk in and catch me scooping strips of crispy fried bacon onto my plate, so I limit my trips to that side of the counter. As even more breakfast choices in town emerge, my morning ritual may become a moveable feast between several places in town. Feel free to stop by the table anytime and pull up a chair—and I’ll promise to put aside my newspaper in your honor. Vickrey often frequents Estate Coffee on Via de la Paz. I love that I saw you today at Estate Coffee!! Loved this article!! Before Terri’s and Mayberry there was a chicken place for about a New York minute. Do you or anyone remember that scruffy cafe? Bob, I saw you almost every morning at Frenchies; which is my shortened name for it, which you forgot to mention. Sure miss those croissants. Thank You Thank You Thank You Bob!!! Having lived here 55 years I well remember some of the breakfast places you describe and where we enjoyed meals and friendship!! Mort’s, Mayberry’s (including Terri’s) Palisades Drug (where I flirted so outrageously with my t0-be-second husband, the pharmacist) and if my memory is correct, Bob’s Restaurant that preceded Art Poole’s! What years!! Adjusting to our new Village, Vintage Grocer’s take out breakfast is a winner!! You should try the Mathew’s Cafe on Swarthmore. It is pretty, the breakfasts are consistently good and the service is very friendly and efficient. (For me it was the cinnamon roll from Art Poole’s. And a short stack from the Drugstore Cafe). I’m jealous. My coffee spot is The Coffee Bean at the corner of Beverly & Robertson with a half dozen friends. We spend the morning making snide comments about everyone not in our little circle. I really like this piece Bob, but perhaps not for the reasons others have expressed. I’ve never been to Pacific Palisades. But I think of a drawing I saw a year or so ago in the ARAMCO World magazine. It featured one of the earliest coffeehouses. The one in Oxford, dating from 1654, the Queen’s Lane Coffee House, claims to be the oldest continuously operating coffee house in Europe (http://www.qlcoffeehouse.com/history-oxford-coffee-house). I imagine an artist with paints and canvas capturing a 17th century Bob Vickrey. Time flickers past and a camera perched on a tripod flashes the 19c. version of you sipping a brew and debating current events and so on until a teen, intent on becoming the next Pulitzer prize winning photojournalist pauses, holds up a cell phone and there you are, still sipping, still engaged in world events and starting conversations with strangers. The world keeps spinning, the coffeehouse keeps morphing or moving down the street, across town, your clothes keep changing with the times, but not your demeanor. The images speed up and all the Bob Vickreys merge. The immutability of change. Great piece, Bob. We share some of the same fond memories. Thank you for suggesting new places to try. Mostly, it left me hankering for scrambled eggs!